Respiratory syncytial virus (RSV) causes infection of the lungs and breathing passages. In adults and healthy children, it may only produce symptoms of a common cold, such as a stuffy or runny nose, sore throat, mild headache, cough, fever, and a general feeling of being ill. But in premature babies and kids with diseases that affect the lungs, heart, or immune system, RSV infections can be much more serious. 1. RSV is a major cause of respiratory illness in young babies. For most babies and young children, an RSV infection causes nothing more than a cold. But for premature babies and infants with chronic diseases and/or lower immune systems, infection with RSV can lead to serious problems. A percentage of these higher risk children can develop bronchiolitis, which is inflammation of the small airways of the lungs, or pneumonia, which can become life-threatening. 2. RSV is highly contagious. RSV can be spread through droplets containing the virus when someone coughs or sneezes. It also can live for a few hours on surfaces (such as countertops, doorknobs or toys) and on hands, so it can be easily spread when a person touches something contaminated. 3. RSV infections often occur during the winter months in Quebec. While an infection usually lasts about a week, some cases may last several weeks. RSV can spread rapidly through schools and childcare centers. Babies often get it when older kids carry the virus home from school and pass it to them. Almost all kids are infected with RSV at least once by the time they're 2 years old. 4. Parents and other adults can easily infect young children with RSV. Because RSV symptoms resemble those of the common cold (runny nose, sore throat, mild headache, cough, and sometimes a fever), parents and other adults may not realize they are infected with the virus but can still be contagious. They can therefore easily pass on the infection to high-risk children through close contact. 5. You can take additional steps to prevent an RSV infection. Ask people to first wash their hands before touching your baby. Avoid kissing your baby in the face if you have cold symptoms. Keep your baby away from crowds. Wash toys and the baby’s environment regularly. Limit the time high-risk babies and young children stay in day care, particularly from late fall to early spring when RSV is most prevalent. 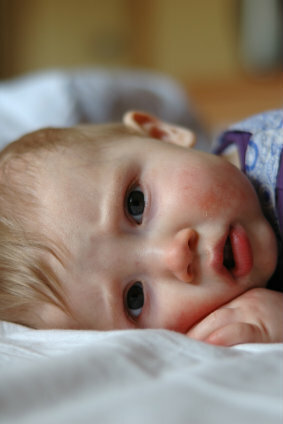 If possible, keep your baby away from anyone, including older siblings, with cold symptoms. 6. To prevent serious RSV-related respiratory disease, at-risk infants can be given a monthly injection of a medication consisting of RSV antibodies. This injection is available at the Montreal Children’s Hospital for children under the age of 2 years old who meet certain criteria. Because its protection is short-lived, it has to be injected once per month for the winter period until the child is no longer at high risk for severe RSV infection. Ask your doctor if your child is considered at high risk. 7. Antibiotics aren't used because RSV is a virus. Fortunately, most cases of RSV are mild and require no specific treatment from doctors. Antibiotics aren't used because RSV is a virus and antibiotics are only effective against bacteria. Medication may sometimes be given to help open airways and to improve breathing. In an infant, however, an RSV infection can be more serious and may require hospitalization so that the baby can be watched closely. He or she may require more fluids and possibly treatment for breathing problems. 8. In healthy kids it's not necessary to distinguish RSV from a common cold. Most healthy children will be able to fight a RSV infection. But if a child has other health conditions, a doctor might want to make a specific diagnosis; in that case, RSV is identified in nasal secretions collected either with a cotton swab or by suction through a bulb syringe. 9. For most babies and young children, at-home care for RSV is enough. 10. There’s good news! RSV infection is entirely preventable.